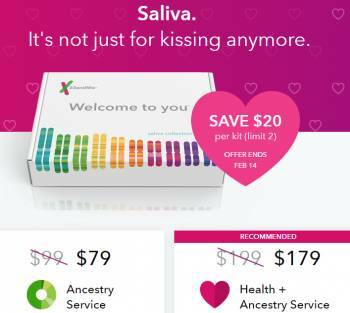 There is a Valentine’s Day Sale at 23andme.com for American users, $20 off for up to two kits until Feb. 14 which brings down the price for the ancestry only version to $79, more in line with the other companies. In other news, rumor has it that non-American users will finally be transitioned to the new experience in the next few months. If anyone from 23andme is at Rootstech this week, I will ask for more specifics on that. The automated triangulation feature now shows all DNA relatives, not just open sharers, and includes anonymous users with a link to request a share. Ancestry composition includes a timeline indicator making a guess as to when your ancestor with that ethnicity might have lived. Click the read more for the details on these. I confess, I am at Rootstech right now, so not there is not much time to write about these in depth, just a few thoughts and images. The other new feature is an attempt to show where on your ancestral timeline ancestors of specific ethnicity would have lived. The problem with this is that the less DNA you share with that ancestor, the more difficult it is to assign such a time line. To that I would add that when you see just a single segment on your ancestry chromosome painting that matches a specific population, the time when that ancestor lived could be much older than indicated, since the inheritance of those single segments is quite random. My father is 100% Norwegian. Or so I thought before I started doing genealogy. Now I know he had a German engineer for a 4th grandad. Dad’s British and Irish is listed as 9.8% but to our knowledge he has no ancestors from there although his Viking ancestors did a lot of visiting. However there are one or two unknown ancestors back in the 1700s. So perhaps one or two of them were British or perhaps this comes from that German ancestor or perhaps the admix technology is just not that good yet. The South Asian is less than 1% so a very doubtful piece on chromosome 6 in the painting except that my brother inherited it. Could you ask about Ancestry Service only in the UK – the full service is very expensive here and I want to try testing with 23andMe. The addition of non-open sharing relatives to the triangulation had immediate results for me. My two 2nd cousins were on the old experience and never opted in to the new open sharing. I was immediately able to narrow down some of my 3rd and 4th cousin matches to those two lines. One 4th cousin had just enough surname information that with the addition of seeing the mutual match with my 2nd cousin I was able to identify the likely MCRA. I had the entire collateral branch in my tree already from earlier genealogy research. This is going to be even more exciting when my father’s results come in any day now! 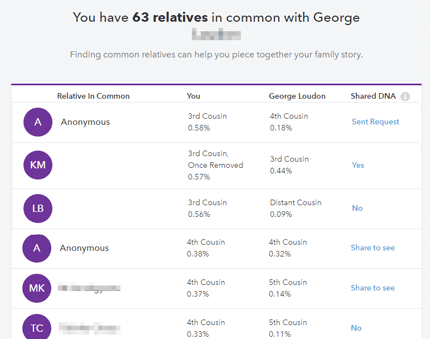 OMG since I added my dad to 23andMe and have his 2nd cousin available, I love the updated Relatives in Common feature even more! More than 1/2 of the best mutual matches were still “anonymous” or not opted in. All I had to do was click on the “share to see” link to request sharing and send a quick message to these people I probably would have never otherwise identified.